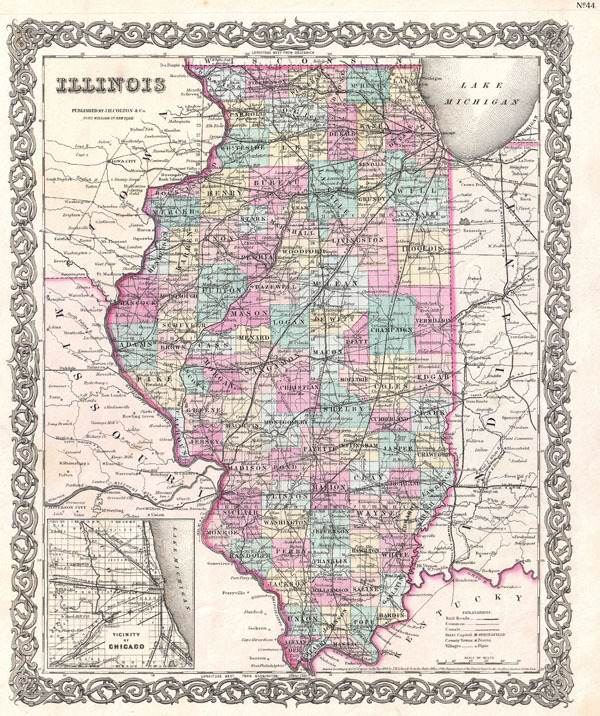 This is the 1855 issue of J. H. Colton's map of Illinois. Depicts the state of Illinois along with parts of neighboring Iowa, Missouri, Indiana and Kentucky. Color coded according to county. Shows major roadways and railroads as well as geological features such as lakes and rivers. An inset in the lower left quadrant focuses on the vicinity of Chicago. Dated and copyrighted: 'Entered according to the Act of Congress in the Year of 1855 by J. H. Colton & Co. in the Clerk's Office of the District Court of the United States for the Southern District of New York.' Published from Colton's 172 William Street office in New York City, NY. Joseph Hutchins Colton (July 5, 1800 - July 29, 1893), often publishing as J. H. Colton, was an important American map and atlas publisher active from 1833 to 1897. Colton's firm arose from humble beginnings when he moved to New York in 1831 and befriended the established engraver Samuel Stiles. He worked under Stiles as the 'Co.' in Stiles and Co. from 1833 to 1836. Colton quickly recognized an emerging market in railroad maps and immigrant guides. Not a cartographer or engraver himself, Colton's initial business practice mostly involved purchasing the copyrights of other cartographers, most notably David H. Burr, and reissuing them with updated engraving and border work. His first maps, produced in 1833, were based on earlier Burr maps and depicted New York State and New York City. Between 1833 and 1855 Colton would proceed to publish a large corpus of guidebooks and railroad maps which proved popular. In the early 1850s Colton brought his two sons, George Woolworth Colton (1827 - 1901) and Charles B. Colton (1832 - 1916), into the map business. G. W. Colton, trained as a cartographer and engraver, was particularly inspired by the idea of creating a large and detailed world atlas to compete established European firms for the U.S. market. In 1855, G.W. Colton issued volume one the impressive two volume Colton's Atlas of the World. Volume two followed a year later. Possibly because of the expense of purchasing a two-volume atlas set, the sales of the Atlas of the World did not meet Colton's expectations and so, in 1856, the firm also issued the atlas as a single volume. The maps contained in this superb work were all original engravings and most bear an 1855 copyright. All of the maps were surrounded by an attractive spiral motif border that would become a hallmark of Colton's atlas maps well into the 1880s. In 1857, the slightly smaller Colton's General Atlas replaced the Atlas of the World. Most early editions of the General Atlas published from 1857 to 1859 do not have the trademark Colton spiral border, which was removed to allow the maps to fit into a smaller format volume. Their customers must have missed the border because it was reinstated in 1860 and remained in all subsequent publications of the atlas. There were also darker times ahead, in 1858 Colton was commissioned at sum of 25,000 USD by the government of Bolivia to produce and deliver 10,000 copies a large format map of that country. Although Colton completed the contract in good faith, delivering the maps at his own expense, he was never paid by Bolivia, which was at the time in the midst of a series national revolutions. Colton would spend the remainder of his days fighting with the Bolivian and Peruvian governments over this payment and in the end, after a congressional intervention, received as much as 100,000 USD in compensation. Nonetheless, at the time it must have been a disastrous blow. J. H. Colton and Company is listed as one of New York's failed companies in the postal record of 1859. It must have been this that led Colton into the arms of Alvin Jewett Johnson and Ross C. Browning. The 1859 edition of Colton's General Atlas lists Johnson and Browning as the 'Successor's to J. H. Colton' suggesting an outright buyout, but given that both companies continued to publish separately, the reality is likely more complex. Whatever the case may have been, this arrangement gave Johnson and Browning access to many of Colton's map plates and gave birth to Johnson's New Illustrated (Steel Plate) Family Atlas. The Johnson's Atlas was published parallel to Colton's atlas well in to the 1880s. The Colton firm itself subsequently published several other atlases including an Atlas of America, the Illustrated Cabinet Atlas, the Octavo Atlas of the Union, and Colton's Quarto Atlas of the World. They also published a large corpus of wall maps, pocket maps, and guides. The last known publications of the Colton firm date to 1897 and include a map and a view, both issued in association with the Merchant's Association of New York. In 1898, the Colton firm merged with the Ohman Firm and continued to publish as Colton, Ohman & Co. until 1901. Colton, G. W., Colton's Atlas of the World Illustrating Physical and Political Geography, Vol 1, New York, 1855 (First Edition). Very good condition. Blank on verso. Rumsey 0149.049 (1856 edition). Phillips (Atlases) 816.